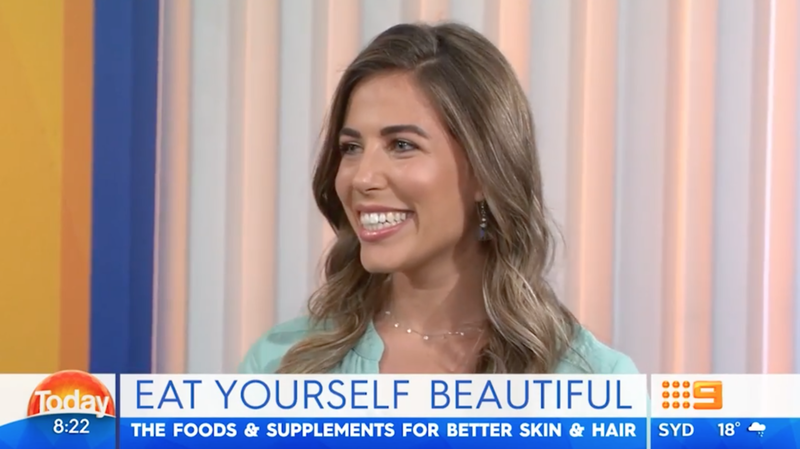 Chatting on the TODAY Show about the best foods to eat for healthy skin! I definitely notice a difference in my skin when I eat certain foods. Of course, no amount of healthy foods can balance out too much stress, not enough sleep and out-of-balance hormones - or change your DNA. So before an event or photo shoot, I make sure I get enough sleep (8 hours minimum), exercise and try to stress less using these strategies. Eat like the Mediterranean and load up on tomatoes. They contain lycopene (the pigment that makes the fruit red! ), a seriously awesome antioxidant that neutralises free radicals that cause premature aging. A study found that those who consumed tomato paste 33% more protection from the sun. Don't skip the sunscreen but do add tomatoes to your meals like this breakfast. Dark chocolate can help your body produce endorphins, reducing stress and making you feel good. In addition to reducing stress and putting a smile on your face (arguably the easiest way to look more beautiful! ), dark chocolate contains flavonols, antioxidants that can slow the signs of aging. I love Lindt chocolate. Look for chocolate with >80% cacao. You get used to the taste! One of my favourite treats from the Keep It Real Program Recipe book. Kiwi fruit are loaded with vitamin C is a powerful antioxidant that helps to reduce inflammation and prevent pigmentation and discolouration. But that's not all! Vitamin C is also needed for the development of collagen, which you need for healthier, thicker skin. You can also get plenty of vitamin C in orange/red coloured foods like oranges, carrots, capsicum. Blood oranges are another great pick. I love brazil nuts. They are loaded with selenium, a nutrient power house that helps maintain elastin, a protein that keeps your skin smooth and tight. Snack on a handful of brazil nuts, crush them and add them to a salad with shave them onto grilled veggies for more crunch. Don't skimp on your healthy fats if you have acne, eczema, and psoriasis. Oily fish like salmon is loaded with EPA and DHA, healthy omega-3 fats that help to combat skin inflammation. Try my favourite Salmon Poke Bowl or Teriyaki Salmon. Did you need another reason to love avocado? I didn't think so. But it may help to know that adding avocado to your sandwich, salad or breaky bowl with help balance those blood sugar levels. This means more stable mood, energy, hormones and clearer skin. Make sure you get a yoghurt that contains probiotics - as opposed to just 'live cultures'. They aren't the same thing. The probiotics in yoghurt help reduce inflammation for clearer, more spot free skin. I choose plain Greek yoghurt and I will sometimes drizzle with honey if I want it a little sweeter. I also take a probiotic supplement (it's the only supplement I take). Self-conscious over a spot that is taking ages to disappear? Eating foods high in zinc like pumpkin seeds (also known as pepitas) will help with wound healing and can help clear up the spots fast. I prefer eating seeds than taking a zinc supplement. I LOVE pumpkin seeds on salad for crunch and I also add them to my morning yoghurt for more fibre, prebiotics and healthy fats. Whole grain cereal naturally contains silica, a nutrient that helps to keep skin elastic and collagen healthy. You may have seen silica supplements which you can use if you have very brittle hair, nails and skin or you can also eat foods containing silica like strawberries, apples, cucumber, asparagus and honey. Oats will also keep your blood sugar levels more stable for better skin. Want to set up good habits? Do you want to learn to eat healthily without dieting, obsessing or feeling guilty? Then you will love my Keep It Real Program.